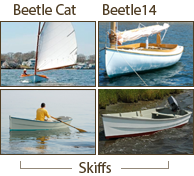 Using scrap cedar wood from the construction of the Beetle Cat sail boats, owner Bill Womack and his grandson Filippo Tagliavia built a half dozen bluebird houses for novelty Christmas gifts. 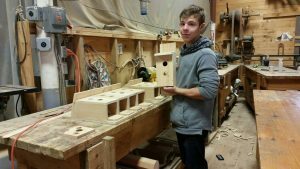 Introduced at the Beetle Boat Shop’s annual Christmas Open House on Dec 3rd, 2016 the birdhouses were an instant success. The bluebird houses were “going like hot cakes” said CFO Michelle Buoniconto; ” I could not collect the money fast enough”. Paint shop manager Marc Blandin said he saw an open house guest clinging to her birdhouse like it was her most prized possession, visions of “Black Friday”. Built out of Atlantic white cedar and branded with the Beetle Cat logo, the bluebird houses have become an overnight hit for the Beetle community as Christmas and spring gifts. Womack said we will have to divert the focus of the entire shop onto bluebird houses in order to meet the demand. Grandson Filippo Tagliavia will be flown in from Texas over the Christmas holidays to add his expertise to the process. Who would have thought that such an innocent endeavor would generate such a large interest? Order now to ensure spring delivery. Orders will be filled in the order they are received.